Almost got the first healthcare post ready, but in the meantime I’ve been doing a little brewing, and I thought I’d share some of the results. I’ll continue to try to use book review and brewing posts as filler between more serious posts that take me more time to develop. 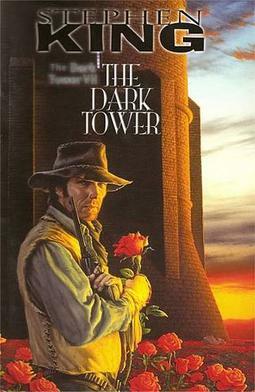 I recently bottled a batch of graf, a fictional apple beer or cider-beer blend from the mind of Stephen King, specifically from the Dark Tower series, which is a fun set of books that I started reading as a little kid, but King only recently finished. I really liked this idea, because I like fruit flavors, and love ciders and wines as long as they are dry, but I don’t like the thinness I perceive (because I usually stick to beer). 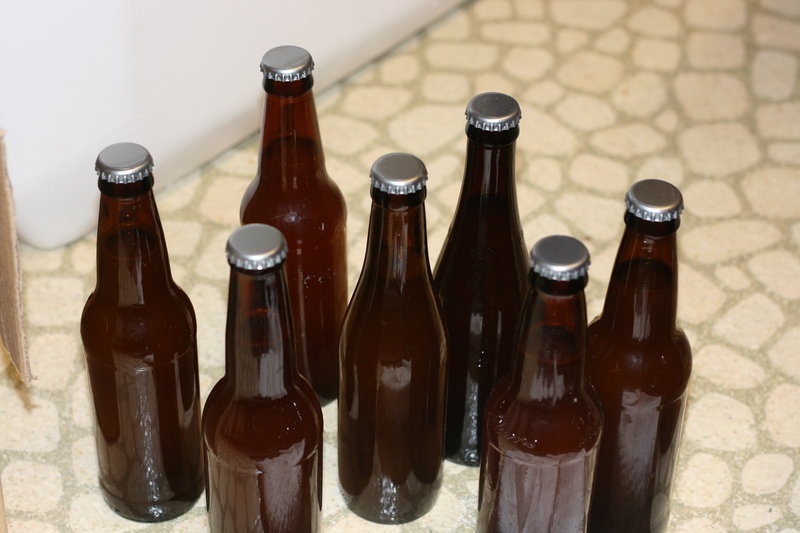 I brewed this with some store-bought cider (sans preservatives of any kind! 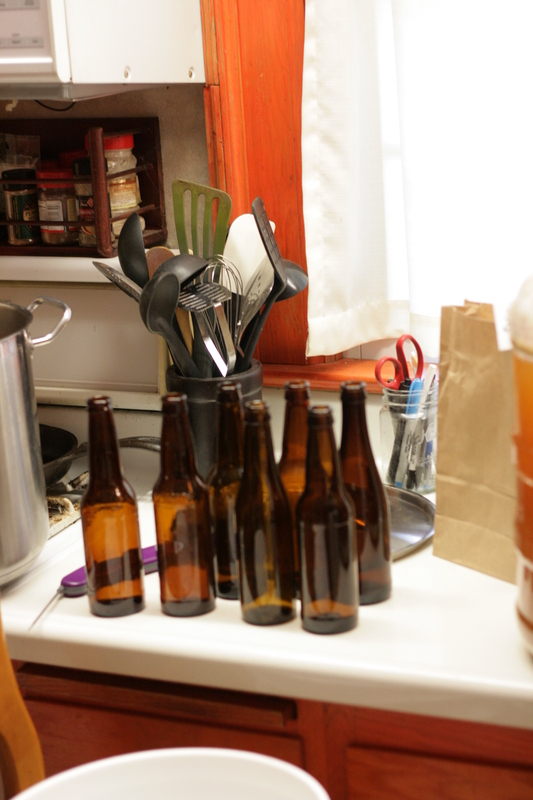 ), apples, malted grain, my house yeast, and Hersbrucker hops. There are a lot of recipes out there for graf (alot of brewers call it ‘graff’ but I kind of like the spelling from the book so I’m gonna use that. I started with Brandon O.’s recipe, but made a bunch of modifications. Fermented graf – note the apples chunks floating on top still. 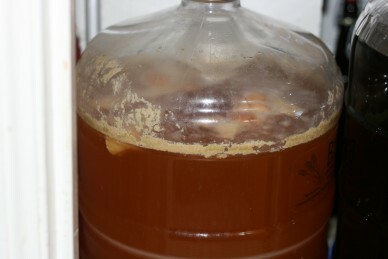 Yeast – I used my house strain, which started as a Redstar Belle Saison with some US-05. Didn’t make a starter, but had a whole pint jar full of cake from a previous batch. Mashed high for some body, and boiled the wort for 30 minutes. Did not boil the cider. Poured the cider in the carboy, chilled and poured the wort. Chopped up some farm apples and tossed ’em in. Shook and then pitched. I always use a little Fermcap S to control foaming, which works amazingly. Fermented at about 68F without temp control. Some small bottles for competitions. … and some 12 oz. 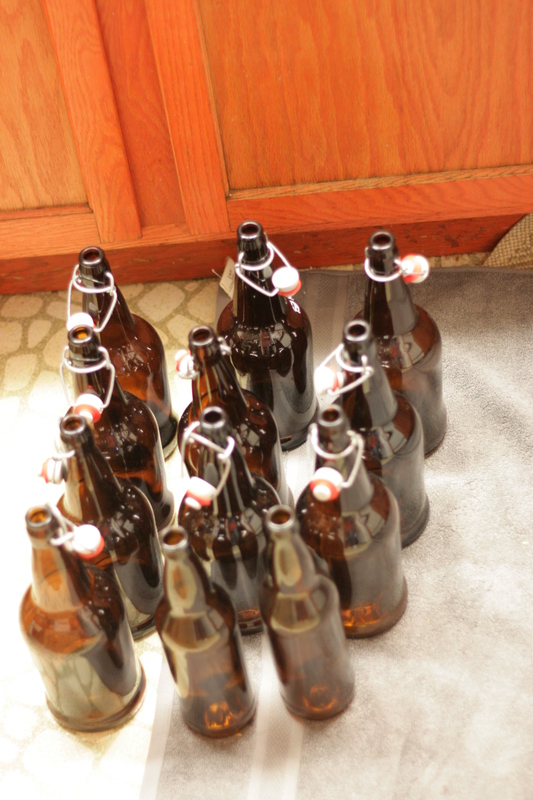 bottles, but I mainly save these for submission to brewing competitions. Graf in bottling bucket, where I add sugar and a little casking yeast. Fermented product had some CO2 built up, and tasted pretty darn good. Very little hop character, mostly cider, with a little maltiness. A nice farmhouse character from my house strain. Exactly what I was going for. 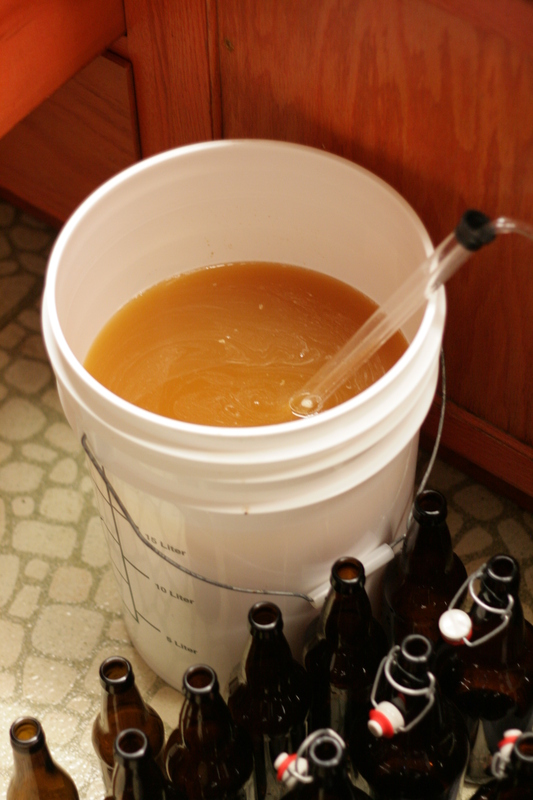 Before bottling, I rack to a bucket, add about 4 oz. 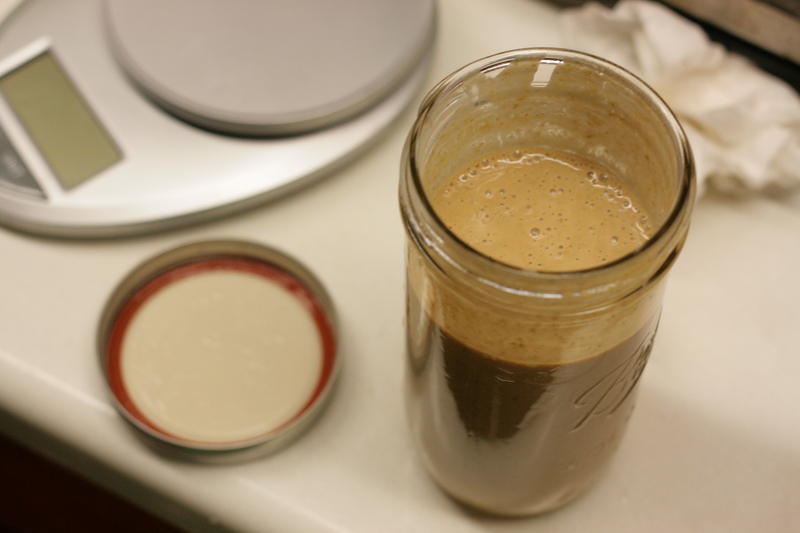 of priming sugar and a shake of some rehydrated casking yeast. I only add the yeast because I had one or two batches that never carbonated well, so now I use it prophylactically. Stealing some yeast to keep my house strain going. I tossed a little of the cake into a jar as I usually do to pitch again for a later batch. Lately I make a lot of ‘farmhouse’ style beers, where I’m just looking for new and interesting flavors, and not necessarily reproducibility from batch to batch. The batch before this was a saison version of Short’s soft parade, a delicious high grav fruit and rye beer from Michigan. Some finished product – Dirty Dog Billy Bumbler. My homebrewery is Dirty dog, named in honor of my dog, and billy bumblers are from the books. And here’s some finished product with O2 caps on, which isn’t something I feel very strongly about, but a cheap precautionary measure I use with bottles I save for competitions. Send me some!!! Sounds delicious! These posts on brewing are awesome. Keep ’em coming! I sent both of the past two homebrew posts to my dad because he recently expressed an interest in developing the hobby. Thanks! I’ll definitely keep posting these – they are much quicker and easier to write than posts on biology!